Have you ever absorbed the beauty of the Hudson Valley from above? It's well worth the view…I guarantee you, and I'm afraid of heights!!!!!! 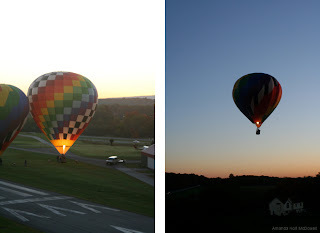 On any given weekend in the Hudson Valley look up…you will see Hot Air Balloons all over the place, and for good reason. One of the best ways to experience the Hudson Valley is from above! I took my leap of faith (forgive the pun) a few years ago. I'm deathly afraid of heights and will not get into many aircraft, but for my Birthday I was invited on a Hot Air Balloon ride. OMG…I said yes…. 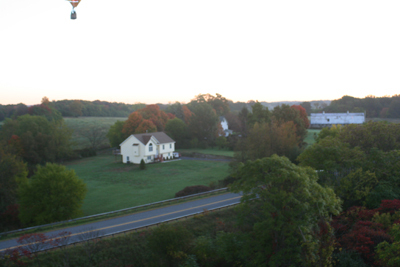 Fantasy Balloon Flights, Inc is the company that piloted our Hot Air Balloons. We took off from Randall Airport in Middletown, NY. It's an early start to the day..I think we were there gearing up at 6am. The entire time I was shaking with anxiety and excitement. What was I doing…. The sound of the blowers to inflate the balloons are loud…It's also exhilarating to watch them inflate…so pretty!..Once they were fully inflated and it was determined that the wind was appropriate for flight (a huge factor for ballooning), we climbed in (me scared to death). Then it was time to take flight. Our pilot asked us to all close our eyes…so we did (me reluctantly). The blowers started and in about 30 seconds he told us we could open our eyes….Holy CROW…we were already way up in the sky, you don't even feel like you moved an inch and there was absolutely no sound up there once the blower stopped!!! That's what it's like. You don't have the sensation of movement or sound, you just float. It was one of the most beautiful experiences I've ever had. I never fully appreciated the beauty of the landscape as much as I did on this day and the sensation of floating in the sky is like no other. I was truly high on life (It was also my Birthday). When you land (in a random place might I add…they have tracker/chaser vans following you on the ground)..they pack up the balloon's/baskets and drive you back to the airport where you get a certificate of flight and a glass of Champagne..nice!!! Below are some links and pics for you to explore and hopefully with warmer days ahead you will take flight over the Hudson Valley and enjoy a Heavenly ride!